Thank you for your kindness, your financial support and your prayers for our mission’s important work. Everything we accomplish we accomplish because of you. Right now, times are very lean, and we need your helping hand more than ever. Last month, we received several notes concerning our coming independence from the Diocese of Fairbanks (Catholic Bishop of Northern Alaska), and we want to assure you that this Catholic radio mission will remain strong: with your help. As you may know, the diocese did subsidize about 6% of KNOM’s expenses for about 10 years, ending more than 15 years ago. Since then, it has been you, and good people like you, sending gifts directly to KNOM in Nome, who have kept our radio mission vibrant. This positive step was mandated by the diocese’s court-approved bankruptcy settlement. We look forward to a seamless transition and to a future, again thanks to you, that will be sound and robust, as in the past ever improving, with the continuing approval of the diocese, the same staff and the same educational and inspirational programming that has won KNOM so many national awards, and more importantly, the loyalty of almost everyone within 100,000 square miles. Once more, we thank you from the bottoms of our hearts, and we pledge to keep KNOM beaming brightly. As always, you and all of your intentions will remain in our prayers. Again, thank you! 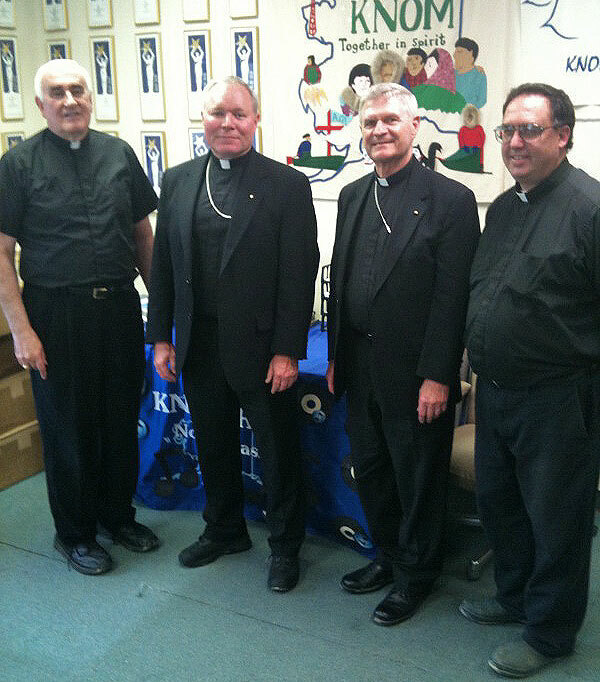 A MASS OF HEALING: From left, Fairbanks Bishop Donald Kettler, Juneau Bishop Edward Burns, and Anchorage Archbishop Roger Schwietz, OMI, are joined by former KNOM volunteer, now pastor of Nome’s St. Joseph Parish, Ross Tozzi in the KNOM front office. The bishops were in Nome to concelebrate a Mass of healing in Nome’s church, broadcast over KNOM. As Mass began, they prostrated themselves before the altar. They asked for forgiveness, and spoke with piety and sincerity. A constant fidelity in little things is a great and heroic virtue. KNOM is the oldest Catholic radio station in the United States: beaming strong, thanks to you. WHEN GOODBYES ARE HAPPY: (left) KNOM volunteer music director Danielle Sylvester takes a reading on the 1,000-Watt FM transmitter installed by Tom Busch the previous day. After two very energetic and hardworking volunteer years, Danielle is leaving KNOM but will remain in Nome as coordinator for a local tobacco prevention program for children in kindergarten through the twelfth grade. “I really feel a part of this community,” Danielle says, and she has been very active. She is an event organizer in Nome’s Rotary Club and – as a certified Emergency Medical Technician and Certified Emergency Trainer – is often on call, as a volunteer, to drive Nome’s ambulance. Among other things, she has also coached elementary school soccer. While she’ll be missed by fans of her weekday morning show, we bet that her voice will be heard over KNOM at least occasionally, and we know that you join us in wishing Danielle every success. The pay isn’t much, but the retirement benefits are out of this world. LOST AND FOUND: A visitor to Nome was returning from a fishing trip up the beach on a 4-wheeler all-terrain vehicle. Back in town, he noted that his backpack had fallen off the little ATV’s rear rack. He was desperate. Not only did the bag contain his wallet with all of his IDs and credit cards, but it also contained several prescription medications. As he was frantically looking for it, someone suggested calling KNOM. He did, and less than two hours later, you can imagine his relief when he was at the studio retrieving his pack, which a listener had found and dropped off. LEGACY: Please consider adding the KNOM Radio Mission to your will. As we have promised for many years, we place all bequests into funds that will be used for future major improvements, or to protect the mission during emergencies. Many present and past KNOMers have substantial bequests to the station in their own wills. For them, these will be the most significant financial contributions of their lives, and the same can be true for you. OUT ON A LIMB: (right) General Manager Ric Schmidt performs “other duties as assigned” 18 feet above ground on the KNOM AM tower. The feed line carrying the 25,000 watts had broken loose from its stabilizing insulator and was flapping in the wind. The little plastic tie restraining it had held for thirteen years. For Ric, such high-wire work is fortunately rare! May the gentle breezes comfort you and yours. Let the spirit of happiness brighten your day. May you receive and develop the power to grow. Let your heart be strong, accepting life as it happens, with courage to correct things that you can. ...among many, many others, thanks to you. One series, “Alaska Science Forum,” has been produced by KNOM for an incredible 34 years. Another, “Today in History,” now voiced daily by Ric Schmidt, has been on the air for just over 25 years. Why is your broadcast of the Mass so important? Of the villages we reach, many are predominantly Catholic. Because of their remoteness, the great distances between them, and the acute shortage of priests, only two villages have a priest as many as two Sundays a month. 12 of these villages see a priest only once every three or four weeks, six see a priest one Sunday every two months, and three have Mass but once or twice a year. In addition, there are dozens of villages which are not predominantly Catholic but which still do have some Catholic residents, and these places are never visited by a priest. During the summer, many villagers set up camps in the wilderness to gather food for the winter. In these far-flung locations, KNOM’s signal carries the only Mass in which they can participate. In isolated Little Diomede – located on an island in the Bering Strait – villagers place a radio on the altar of their small St. Jude’s church to pray with the KNOM Mass. How much does it cost to mail me the Nome Static? Right now, it’s about 51 cents per issue. We do everything we can to keep costs as low as possible. Do you really pray for your contributors at your weekly staff meetings? FORTY YEARS AGO: Autumn 1970 is busy. Late in August, John Pfeifer arrives. 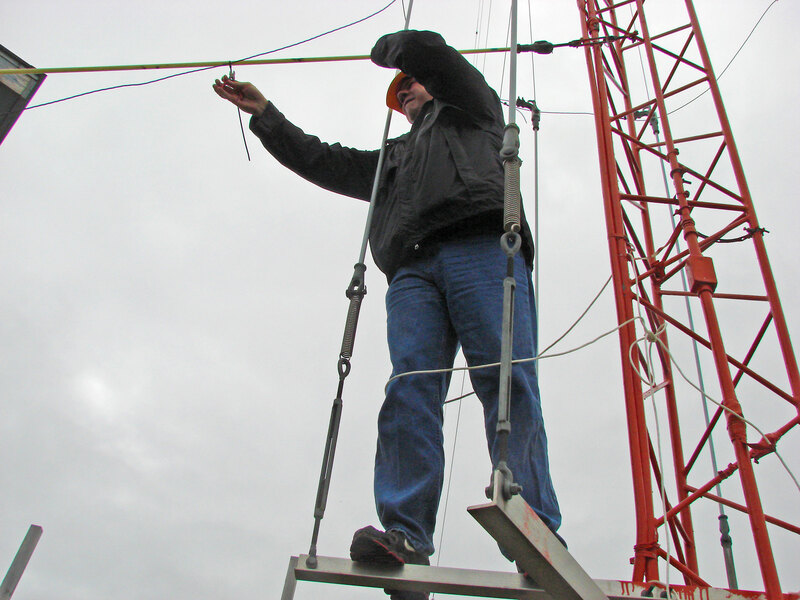 He and fellow volunteer Tom Busch erect a 49-foot guyed tower at the studio. A week later, the main 240-foot tower arrives by barge in 20-foot sections, seen here with John (at left, top), each weighing 700 pounds. From Nome’s port, the pair transport them to the station using an ancient, rented, 11-foot flatbed truck. Its brakes are shot. Newly filled with fluid, they are good for only two brakings. Tom drives, while John sits on top of the precarious pile in a successful attempt to steady them during the terrifying first-gear trip. 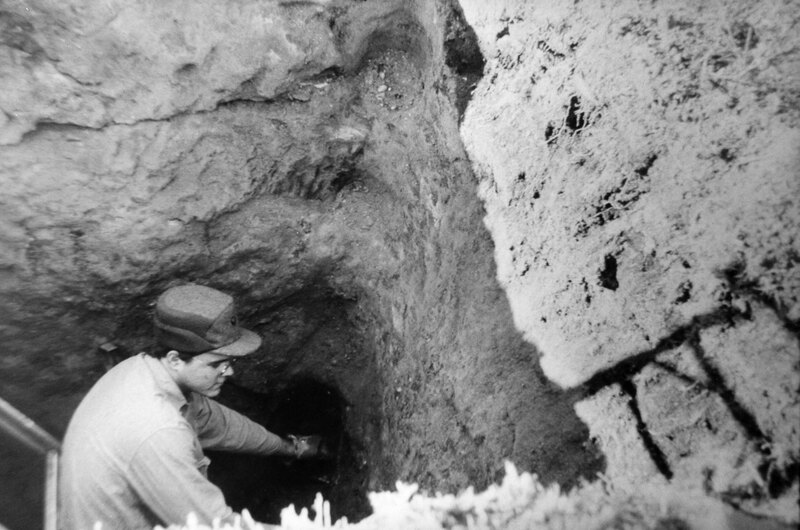 On October 16, 1970, the tower’s 20-foot deep foundation hole in the permafrost is not quite wide enough. The volunteers use an old miners’ trick, setting driftwood ablaze with gasoline. The next day, its bottom 14 feet are filled with sooty muck. John and Tom are suffering hernia pains, and volunteer John Schuessler singlehandedly buckets out the mud. On the 18th, ten inches of forecast snow fail to materialize, and Tom Karlin, assisted by Br. Randy, assemble forms and steel rebar structures for the tower foundation and three 5-foot deep guy anchors. A local company pours very soupy concrete into the main hole, then a second load that’s nearly dry powder, as their truck runs out of diesel a thousand feet short of the site. With temperatures below freezing, Karlin fashions homemade kerosene smudge pots beneath canvas tarps for each of the four piers. One night, the tarp for the southeastern guy anchor is ablaze. 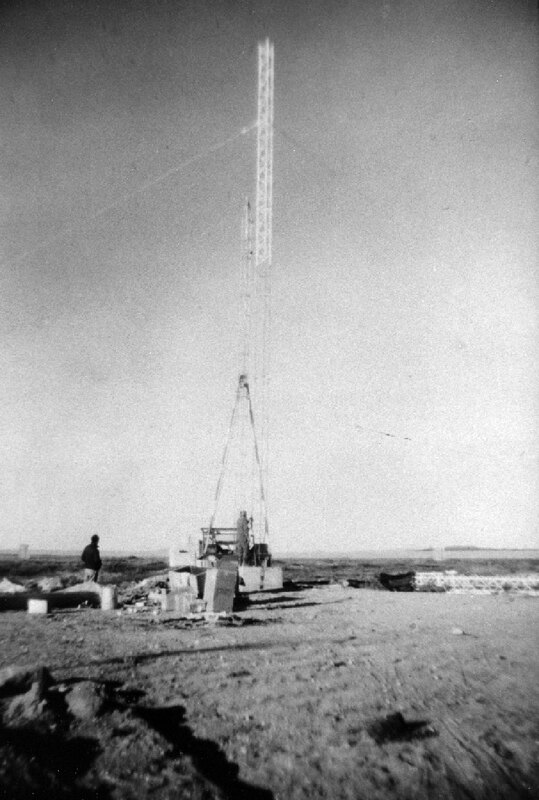 On October 26th, a professional crew begins erecting the tower. Interrupted by two days of blizzard, the project is completed on Halloween. There are great sighs of relief. (at left, middle) The tower is in place, and two climbers zip to the ground. Photo bottom left - a web extra (not seen in the print edition of the October 2010 Static): The Utility tower crew uses an A-frame to hoist to vertical the bottom 60 feet of the tower. TEN YEARS AGO: In October 2000, KNOM accepts its eighth Gabriel Radio Station of the Year Award. KNOM wowed a panel of experienced radio producers with the breadth of community service, its strong orientation to its audience’s needs and its clear commitment to the people it serves. The station is obviously in touch with its listeners. Not only that, the content and quality of its locally produced spots matches – or exceeds – what one might expect to hear on a more fully funded or commercial station…KNOM is right on target! The model for good Catholic owned radio. Going to church on Sunday can be a beauty treatment. You can have your faith lifted! Thank you again for your kindness to the people whom we serve. God bless you abundantly!